Sotheby's London will auction off drawings and silver,a.o. from the collections of the Dutch RF. The top piece is a drawing by P.P.Rubens. The RF is cleaning up their atticks,there have been other auctions,anonymous,here in The Netherlands too recently. All those palaces must be pretty stuffed if they can't find a spot for a Rubens. Why are they having a clear out? Cash is easier to divvy up between heirs? The website of Sotheby's says that the Rubens drawing ïs the: "property of a princess". It is expected to fetch between 2.5 and 3.5 million dollars. It belonged to the collection of King Willem II. Note that after his death most of his art collection was sold to the Russian emperor. His heirs feared that they would be unable to pay the king's enormous debts. There are 12 other drawings of old masters to be sold and several lots with porcelein, glassware and silverware. These are expected to fetch another 2.5-3.5 million dollars. Among these lots is glassware that was a gift to Juliana and Bernhard on the occasion of their wedding. The NRC claims that the Rubens drawing used to grace the walls of the NYC appartment of Princess Christina. Under Dutch law each child receives the same share of assets from a deceased parent. To keep the most important items together Queen Juliana started several funds. The foundation of the royal art collection supposedly has the most important items in it. The drawings that are auctioned off were perhaps not added to this foundation. Perhaps the late Queen interpreted the foundation in a way that only items relevant for the royal family were added: namely paintings of ancestors and such. A Rubens drawing has little to no connection to the house of Orange, even though it may be of superior art historic value than other pieces that were added to the foundation. The items that are sold of may be owned by Princess Christina or perhaps they were not divided between the four sisters. The article is not clear about that. I am surprised that a Rubens drawing can still leave Europe, I thought there were some laws in place to make sure our patrimony does not leave the continent. Let's hope at the very least that it will be acquired by a museum and not by some billionaire. The RVD refused to comment. It will be worth watching to see whats sold in New York on January 30th and also would there be any objection to the sale of a Rubens by the royal house? The Drawings are from Rubens itself, his Paintings are from himself and his Atelier. In 2016 some concerns were raised when the family sold a painting by Raden Saleh to a museum in Singapore and 1200 maps from the 17th and 18th century to John Fentener van Vlissingen. The concerns were multiple: why were the works not offered to Dutch musea? Can it be considered national heritage? Who is the owner of the pieces? King Willem II paid for much of his collection from state money. And why does the royal archive decide what items are considered private property of the family and which ones belong to the state? Etc. Many people were/are -falsely- under the impression that all items that belong to the royal family art part of a royal collection and can not be sold. Note that the maps were registered under the Royal Collections. But according to the RVD they belonged to the part of the collection that was considered private. The family also sold a table and chairs of the Indian Hall in Noordeinde palace. So the foundation must protect a more limited amount of items than was previously assumed. The border between state and private property can be unclear. i read somewhere (Jutta Chorus biography of Beatrix IIRC) that Queen Beatrix removed some items from Soestdijk that she considered private. The secretary of culture at the time thought that they belonged to the state and sent a truck to Huis ten Bosch to collect the items. Something simular happened in Belgium when the then CP Philippe wanted some furniture from the palace on the Meir in Antwerp for his private apartments in Laeken while the Flemish government said the furniture belonged to the state & the items were duly returned. It is a pity that the Rubens drawing -as maria-olivia says: by the master himself and not by his atelier - was never added to the art foundation of the RF. Noordeinde and Dam palace -which both resemble High end hotels instead of palaces- have plenty of empty walls. But considering it is private property they have all the right in the world to do with them as they see fit. If f.e. they belong to Pss Christina, it makes no difference if she sells them now or if her descendants will do so in x decades, as we saw in Denmark recently. The general public of course has mostly other concerns than art or the royal family. Princess Christina and her former husband Mr Jorge Pérez Guillermo have been very active in buying and selling artworks and antique. Their newly build villa, De Eikenhorst, on the royal estate De Horsten (now owned by the King) was stuffed from floor to roof with paintings and artworks. Princess Christina lives abroad. Her children live abroad. They have virtually no any royal business to do (in contrary to their Bourbon-Parma cousins for an example) and that part of the family has been active in selling and investing, for an example with trusts on the Channel Islands. The two pictures also show total different tastes in art and understandably that private persons can buy art, but of course also sell art. During/after the divorce the princess auctioned the collection that she and Jorge Guillermo built. 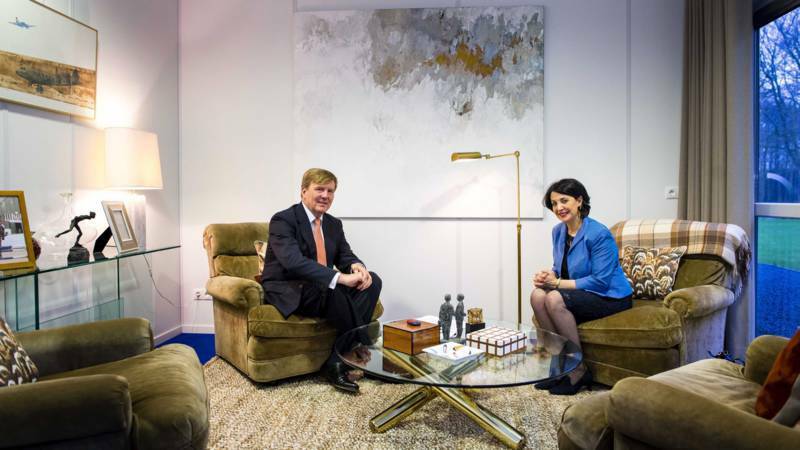 I believe one painting (with a peeled orange IIRC) was bought by Palace Het Loo. The items that are offered today supposedly come from the inheritance of Queen Juliana. It is possible that they belong to Pss Chrstina but it is not certain. Note that Queen Juliana was no stranger to selling possessions either. You will be familiar with the story that a shocked courtier reported some of Juliana's jewels stolen after seeing them offered in a shop window in London, only to discover that it was the Queen herself who sold them. It is fortunate that the most important paintings of the family were donated by King Willem I to the state. They form(ed) the base of the collection of our national museum. It was the second time he saved these treasure for the nation. The first time was after the battle of Waterloo when he sent the army to the Louvre to confiquate them after the French looted them. The Italians were unable to do so. The foundations set up by Queen Juliana are stuffed with items considered "subservient to a proper execution of the royal dignity". Of course, one can argue: is a drawing of Rubens or 18th C silverware not subservient to the royal function? But when one visits exhibitions in Amsterdam or Apeldoorn and sees the artworks but also all the gold-, silver-, crystal- and porcelain ware during State Banquets, when one sees the unbelievable jewels of Queen Máxima and when we know that the Royal House Archives in The Hague have extra underground floors in depôt added, and that the conservator of Het Loo says "only a fraction" from the collection of the House is in exhibition, then we may assume all four the Princesses have received valuable items but that the bulk, with the most important items, have been placed in these foundations, to serve King Willem-Alexander or the future Queen Catharina-Amalia. It is fortunate that the most important paintings of the family were donated by King Willem I to the state. They form(ed) the base of the collection of our national museum. It was the second time he saved these treasure for the nation. The first time was after the battle of Waterloo when he sent the armybto the Louvre to confiquate them after the French looted them. The Italians were unable to do so. All this material to be auctioned is from the late Princess Juliana's youngest daughter.She has no use for them nor have her children as they all have a shipload,or in any case more then enough of this sort of items.All is legal without any trouble/problem by anyone else of the Family nor Dutch Law.It's all simular to the sale last month of items of the estate of the late Danish Princess Elisabeth by her offspring. We,or some,might think the world of it all,but to the sellers it's all the same,with the exception of a Rubens ofcourse.The Dutch Museum Fund will try to keep the Rubens within our borders,I hope they succeed. I understood none of the offered items is in the database with protected patrimonium under the Erfgoedwet 2016 (Heritage Act 2016) which would mean it needs to be offered to Dutch museums or the State, to protect it from leaving the country. The Rubens drawing is of importance but not that important that there is a ban to bring it to auction. I don't think the purpose of the art collection is "to serve King Willem-Alexander or the future Queen Catharina-Amalia". Instead, to use the same terminology that is used in the UK to refer to the Royal Collection and the Occupied Palaces Estate, they are "held in trust by the sovereign for the nation". "To collect and to manage the archivalia of the House Orange-Nassau, the House Nassau, or a House related to these"
This foundation is the base of the House Archives and it's building in the park of Noordeinde Palace. "To ensure that descendants of Her Majesty Queen Wilhelmina, princess of Orange-Nassau, have properties at their disposal, needed for the execution of the royal dignity"
This foundation is the base of the countless properties in the palaces which are in use. From carriages to jewels. From artworks to goldware. "To collect and to manage works of art and objects related to the House Orange-Nassau or the House Nassau which are no longer in daily use"
This foundation is the base of the countless objects loaned to exhibitions, loans to Het Loo Palace, loans to museums in- and outside the Netherlands, loans to private houses of members of the royal family. Sotheby's stated that the offered items (drawings, china, glassware by Lalique, some 18th C silverware) are "property of a Dutch princess". The drawing of Peter Paul Rubens was acquired by King Willem II, the Lalique glassware a gigt to Queen Juliana, so we know it is from the inheritance of Queen Juliana to one of her daughters. It seems the drawing was seen in the New York appartment of Princess Christina, so possibly she is the seller. Anonymous Dutch Royal put up Rubens drawing for Auction. Owner of private collections are free to auction off the item. Certainly the Dutch Royal family knew it. A lot a minor royals are in money need , it started last year with the Bourbon and the Rosenborg. Princess Christina is absolutely not in need: Queen Juliana has set up a special foundation to finance her three youngest daughters: Stichting Bewind 1963. Followed by another foundation: the Foundation Functional Costs House of Orange-Nassau 1968. The Princesses Irene, Margriet and Christina have never had a normal paid job or something. They have married pauvre husbands. But they lead fine lifestyles. That money is provided by these foundations, plus their inheritances (after 2004), plus the loans of properties from royal foundations to use in their private houses. These three princesses are all in their seventies and have children and grandchildren. The real fragmentation will start there, with the four Bourbon-Parmas, the four Van Vollenhovens and the three Guillermos. And all of them will have to pay inheritance taxes. And maybe the three Guillermos or Christina's advisers said: sell the Lalique, sell the Rubens, sell that porcelain, invest it in assets. It will save them problems with distribution and taxes. 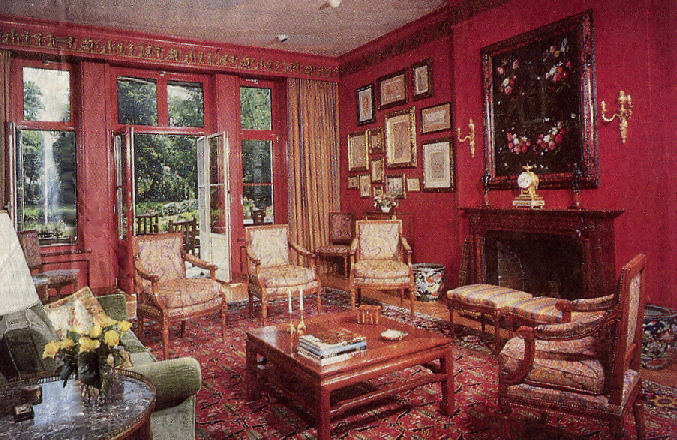 Hard to believe its the same room ,though the red colour is a bit over powering I prefer the style of the room during Princess Christina's tenure. The Auction is not cancelled and I hope Rubens work will come back to Europe. Well at least they aren't buying those awful sofas and chairs. Absolutely, for the children and grandchildren why have a Reuben on the wall instead of cash in the bank?